If you are running an AdWords campaign you must have a Google Analytics account. We will show you how to link these two accounts so you can unleash the full reporting potential of both platforms. 1. Why should you link Analytics and AdWords? See ad and site performance data in the AdWords reports in Google Analytics. Import Google Analytics goals and ecommerce transactions directly into your AdWords account. Import valuable Analytics metrics—such as bounce rate, avg. session duration, and pages/session—into your AdWords account. Take advantage of enhanced remarketing capabilities. Get richer data in the Google Analytics multi-channel funnels reports. Use your Google Analytics data to enhance your AdWords experience. The linking wizard makes it easy to link your AdWords account(s) to multiple views of your Google Analytics property. If you have multiple Google Analytics properties and want to link each of them to your AdWords account(s), just complete the linking wizard for each property. Sign into your Google Analytics account at www.google.com/analytics. Note: You can also quickly open Google Analytics from within your AdWords account. Click the tools tab, select analytics, and then follow the rest of these instructions. 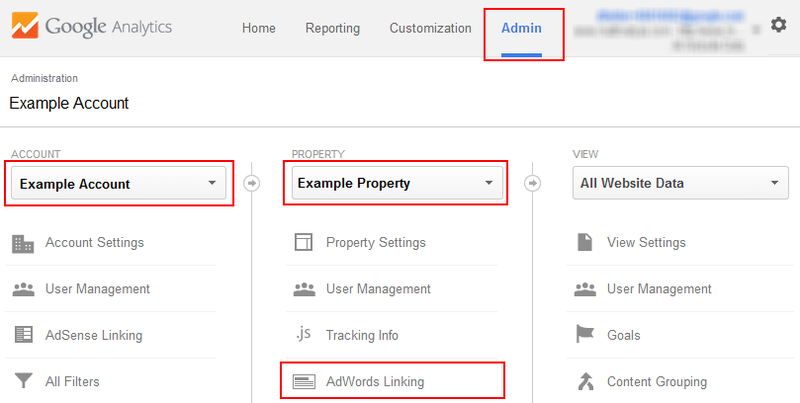 In the account column, select the analytics account that contains the property you want to link to one or more of your AdWords accounts. In the property column, select the analytics property you want to link, and click AdWords Linking. Use one of the following options to select the AdWords accounts you want to link with your analytics property. Select the checkbox next to any AdWords accounts you want to link with your analytics property. If you have an AdWords manager (MCC) account, select the checkbox next to the manager account to link it (and all of its child accounts) with your analytics property. If you want to link only a few managed accounts, expand the manager account by clicking the arrow next to it. 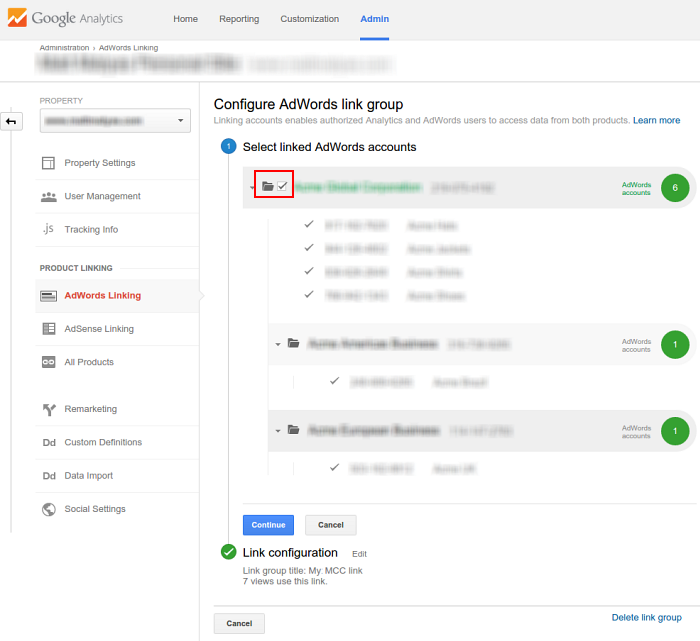 Then, select the checkbox next to each of the managed AdWords accounts that you want to link. Or, click all linkable to select all of managed AdWords accounts under that MCC. You can then deselect individual accounts, and the other accounts will stay selected. 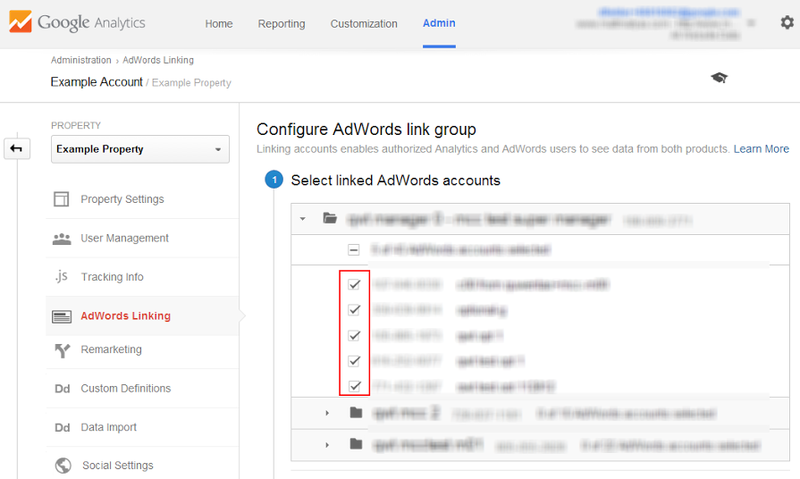 In the link configuration section, enter a link group title to identify your group of linked AdWords accounts. Note: Most users will only need one link group. We recommend creating multiple link groups only if you have multiple AdWords accounts and want data to flow in different ways between these accounts and your analytics property. For example, you should create multiple link groups if you need to either link different AdWords accounts to different views of the same Google Analytics property or enable auto-tagging for only some of your AdWords accounts. Select the Google Analytics views in which you want the AdWords data to be available. If you’ve already enabled auto-tagging in your AdWords account, skip to the next step. The account linking process will enable auto-tagging for all of your linked AdWords accounts. Click advanced settings only if you need to manually tag your AdWords links. Congratulations! Your accounts are now linked. If you opted to keep auto-tagging turned on (recommended), Google Analytics will automatically start associating your AdWords data with customer clicks. For a deeper view and debugging you should also read the Google Analytics guide. Have any questions on setting this up? Get in touch and we’d be happy to help!